Free BB camp, Neighb. News, VOTE! Lots is going on in the neighborhood, around Madison, and in the state. Both the calendar and the article list look long, but many of the articles are very short. Whatever your opinion on the RECALL of the Governor and Lt. Governor, you’ll definitely want to vote either by absentee ballot or at the polls on Tuesday, June 5, 7 a.m. - 8 p.m. See articles 9, and 17-24. The DMNA is prevented by its bylaws from taking a position on the candidates, but it does urge you to learn about the issues in more depth than from TV ads and to seriously consider what’s best for the state, for its people as a whole, and for yourself. at Prairie UU Society, 7 p.m.
3 - Ride the Drive - Downtown - Sunday, June 3, 10a.m.-3p.m. 8 -Lake Vista Café Opens on Monona Terrace! 9 - Need a Ride to Absentee Vote or Register to Vote? 24 - Overwhelmed with Political Ads on TV? Thursday, May 31 is the deadline for applications for the Home Energy Assistance Program, available to help low-income and elderly residents pay their heat and electricity bills. More than 9,000 Dane County households have received assistance through the program since the heating season began last September; the average grant is $275. Energy Services, a Madison nonprofit organization, administers the program in Dane County and 16 other Wisconsin counties. For more information, call 608-333-0333. Parents…. 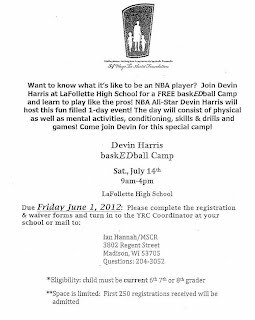 Here is an opportunity for your child to attend a free one day basketball camp with Devin Harris …..former Badger star and now playing in the pros. Youth going into 6th grade in the fall through 8th grade are able to attend. 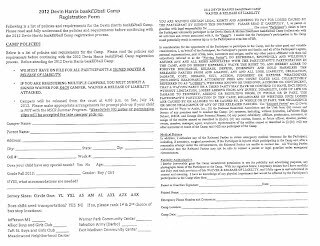 Parents need to complete the attached form and turn it in by Friday, June 1. It can be turned in to the YRC Coordinator a your child’s school or to Ian Hannah/MSCR, 3802 Regent Street, Madison. 250 kids will be able to attend for free, but that number is for all of Madison. Free transportation from this area will be provided from the Allied Boys & Girls Club to the camp and back. Leave time will be provided to parents once they are notified that their child is one of the 250. 3 - Ride the Drive-Downtown- Sunday, June 3, 10a.m. – 3p.m. The City of Madison and Madison Parks are pleased to host Ride the Drive, presented by Trek, on Sunday, June 3 from 10am-3pm. Ride the Drive is a community event that transforms some of Madison's streets into a public promenade. During the event, roads in the five mile route are open for participants to bike, skate or walk through some of Madison's signature streets - including John Nolen Drive, East Washington, and State Street. The event is free and open to the public. Along the route, there will be activities, informational booths, musicians, food vendors and a drawing for prizes. Ride the Drive is a festival on wheels! Along the route, there will be activities, informational booths, musicians, food vendors and a drawing prizes. Family Drive (Brittingham Park) feature bouncy houses, kids games, food and fun. Madison Parks Village (Capitol Square) features, food, vendor booths, and live music from local musicians. Parade Drive (John Nolen Drive/Lakeside Street) features a climbing wall, bicycle demos, games and vendor booths. Bike Avenue (John Nolen Drive and Wilson/under Monona Terrace) features free bike demos, a climbing wall, and Tunes in the Tunnel. For a full listing of events, vendors and locations, please visit the Ride the Drive website. It’s not too late to volunteer for this event. Volunteers are essential to the success of the event. Bring a friend and have twice the fun! To register please go to the Ride the Drive website. The success of the event is thanks to our sponsors and supporters: Trek, Schwinn, Triple M 105.5, Charlie FM, WOLX 94.9, and UWSP Adventure Tours. “BE THE HERO Benefit for CampHERO” is a family friendly fundraising event for the Girl Scouts of WI new summer camp, CampHERO. The event features a Madison based Disco band, VO5, voted Madison's Best Rock Band 2010. Beer, wine, soda, and water, food, Sumo wrestling, dunk tank, and Velcro wall, yard games, photos with local police, fire, and EMS women, celebrity bartenders, and large silent auction are all part of the evening. CampHERO is a summer camp designed to help girls develop courage, gain confidence and build character while introducing them to the protective services. Girls will explore their interests and skills through experiential activities in the areas of police, fire, emergency medical services and dispatch. E-mail ljkarst@hotmail.com for an event poster and/or a CampHERO flyer for girls K-12th grade, held July 15-28. In the mood for a free concert? Then Concerts at McKee may be just your thing. They occur on one Monday night each month, namely on June 11, July 9, and August 13. They are held at McKee Farms Park, 2930 Chapel Valley Road. The park is accessible off McKee Road/PD. Concerts start at 6:30 p.m.
On Monday, June 11 Westside Andy and the Glen Davis Due will perform. Tony Rocker will present “Tribute to Elvis” on July 9. And on August 12, the Steve Meisner Polka Band will entertain. Food and drink is available to purchase at each concert. Remember, the concert itself is FREE. GREAT FATHER'S DAY IDEA! Register for the MSCR Family Day Trip to the "Field of Dreams" Movie site and the "Mississippi River Museum" in Dubuque, Iowa on Saturday, June 16th. Price is only $45 and includes transportation and admission! For more information or to register go to our website www.mscr.org <http://www.mscr.org <http://www.mscr.org> > and search program code 39441. Young swimmers can compete in 2 great Madison School Community Recreation events on Sunday June 17 and Sunday July 15. 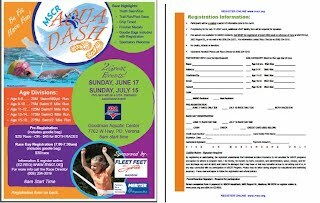 The competition will be held at the Goodman Aquatic Center, 7762 W. Hwy. PD, Verona. Check the attached flyer for more information and a registration form. The Lake Vista Café on the Monona Terrace rooftop announces its hours of operation for 2012. Beginning May 14, the Café will be open, weather permitting, from 11:00am to 3:00pm on Mondays, and 11 a.m. to 7 p.m. Tuesday through Sunday. June, July and August, hours will be extended until 8 p.m., Tuesday through Sunday. The outdoor eatery offers a casual gourmet menu with sweeping views of Lake Monona and the Madison skyline. The Café features a variety of unique appetizers, sandwiches, soups, salads and desserts, as well as assorted summertime cocktails, beers, and wines. Neighborhood voters who need to register to vote and/or wish to vote absentee at the City Clerk’s office can get a ride by going to the Boys and Girls Club, 4-6 p.m. daily. AmeriCorps Wisconsin will be leading litter pickup in Marlborough Park on Wednesday, May 30, from 1:00 to 3:00 pm. 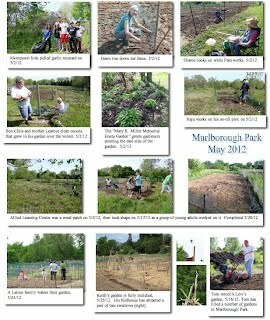 The garden plots in the Marlborough Park community garden will be monitored right after the June 1 mandatory planting date. Those that are not planted will be available for those wanting to garden. Contact Michelle Shively, 608-246-4730, ext 209, if you wish to be put on a waiting list for an available plot. Michelle is the Community Action Coalition Community Gardens Specialist who oversees the Marlborough Park gardens. Alternatively, call garden manager Pablo Granados, 213-2612. Pablo is a native Spanish speaker. A pre-monitoring walk-through on May 25 indicated that well over a dozen plots have not been planted yet. Whether you are a gardener in the Marlborough Community Garden or a member of the surrounding community, you are invited to meet on Saturday, June 16, 1-3 pm, to discuss improving garden security and preventing theft. The meeting will be held at the Marlborough Park Shelter. Stay for ice cream after the meeting. Donna Marie Clark, age 78, died on Sunday, May 20, 2012, at her home in Madison. Donna and her husband James lived on Nieman Place off of Britta Parkway. They recently moved as their apartment building was brought by WI DOT for Verona Rd construction. Jim and Donna both used walkers to get around and rode the Madison Metro bus every day. She was born April 26, 1934, to Fred and Elsie (Norberg) Jestila in Waukegan, Ill. Donna loved the Lord, reading the Scriptures, and working at Fazoli’s. The funeral was held on May 26. Fitchburg Mayor Shawn Pfaff predicted that the Verona Road/Beltline project would provide “a renaissance for Dane County” and referred to “our friends from DOT.” Perhaps the Mayor took his cue from Wisconsin State Journal headline earlier in the day that proclaimed “Huge project to be ‘renaissance’ of area,” but no other attendees who spoke at the May 17 informational meeting indicated any such high hopes. The meeting at the Fitchburg Public Library was attended by a standing-room-only crowd including at least 7 people from the Dunn’s Marsh Neighborhood. Four neighborhood residents made comments or asked questions including Fitchburg Alder Carol Poole, Donna Sarafin, Susan Tesarik, and Mary Mullen. All attendees had a chance to make further comments in writing. Carol Poole expressed her concern for access across Verona Road for fire-fighters and EMS personnel during construction. She wants these entities to be notified in advance of plans affecting access. Donna Sarafin suggested that the painted bike lanes on Seminole should be widened and the traffic lanes narrowed to give motorists the idea that this is a local street where slow speed is a necessity. Susan Tesarik was concerned about the sound walls and whether the ones on the north side of the Beltline would reflect noise into the neighborhood or would be made of sound-absorbing materials. Yes, they will absorb sound. Several designs were offered. One design is like the walls on the Beltline between Whitney Way and Verona Road and along the Interestate. The new plans on display showed a multitude of things. One map showed that pedestrians and bikers could approach the new ped/bike bridge both from Whenona Drive and Niemann Place. A previous map showed access only from Niemann. The DMNA had suggested having access from Whenona as is true now. Traffic increases on diversion routes were noted on another display. A 25-30% increase in traffic on Seminole Highway is expected during peak hours. This translates as 350-450 more vehicles during peak hours, a larger increase than on any route other than PD. It was a surprise to learn that the plans now call for a limestone-like finish for the retaining walls and embankments at the Verona Rd/Beltline intersection and at the location of the roundabout under Verona Road closer to McDonalds. This would make it a moot point to have art be a part of the project as originally promised. Owners and residents on the properties that front the Beltline and Verona Road (called “receptors”) could vote on whether they want the proposed sound walls. One 22-foot-high wall is proposed to protect the subsidized housing on Britta Parkway and the remaining apartment building on Niemann Place. 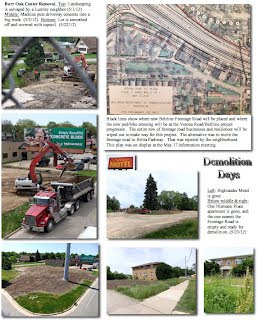 Click on attachments 4 and 5 to see a model of the Verona Road plan and demolition that has already taken place due to this project. Construction is planned for 2014. In case you missed the public information meeting on May 17, some of the materials displayed and distributed are now available on the project web site under "Public involvement" - www.veronaroadproject.wi.gov <http://lists.wi.gov/t/725319/1837417/2881/0/ <http://lists.wi.gov/t/725319/1837417/2881/0/> > . Note - voting for the proposed noise barriers will end on Monday, June 18. Open house meetings will occur at two different locations during the next six months (July - December) to promote public understanding of the project. On June 6 and 18 they will be at Upper Iowa State University, 4601 Hammersley Rd from 5-8 p.m. On June 20, an open house will be held at the Boys and Girls Club, 4619 Jenewein, from 10 a.m to 2 p.m Information on additional dates and times can be viewed on the project web site under "Scheduled/future meetings" on the "Public involvement" page. Mac owners trying to access Fitchburg’s FactTV videos may need to download special free software to view them. Last September Rick Eilertson and Fact TV staff suggested that Mac users might need the Quicktime plugin order to play Windows Media files. It's called Flip 4 Mac. It’s free. The Madison City Clerk’s Office expects record-breaking voter participation in the June 5 recall election. In fact, the turnout is predicted to match a presidential election. That would mean long lines at times. If you have a choice, vote either in mid morning or early in the afternoon. A rule of thumb is that ¼ of the voters come between 7 and 10 a.m., another ¼ between 10 a.m. and 4 p.m.. and the last half between 4 and 8 p.m. when the polls close. Another choice is to vote absentee in the Clerk’s Office by June 1. See articles #18 and# 19 for hours. Turnout in the recall primary in Madison on May 8 was 41% overall. How did local Madison polling place do? Not quite as well. The Madison polling place at Head Start achieved a 32.5% level according to the 8 pm report on May 8. This was much, much better than in February when only 77 people voted, or just 8.2%. However, the May 8 turnout here - as compared to turnout at the Thoreau School polling place - was rather anemic. Nakoma area voters there turned out at a 55.3% rate according to the report. Does this tell you why Nakoma might have more “pull” than people on this side of the Beltline? Actually, we do quite well at influencing what happens around us, due to active neighborhood associations and an alder who listens to us. 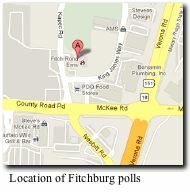 The Fitchburg District 1 polling place that includes the Fitchburg part of our neighborhood plus some other Fitchburg neighborhoods had a 34.9% turnout on May 8. This compares to the spring presidential primary on April 3 when 23.5% of the registered voters came to the Fitchburg District 1 polls. In February, just 7.7% of registered voters cast their ballots. Absentee voting in the Madison City Clerk’s Office began on Monday, May 21 and will continue through Friday, June 1. If you aren’t registered yet, take your Wisconsin driver’s license and a utility bill, printed bank statement, or lease. You will need the item addressed to you at your current address only if your driver’s license doesn’t have the address you live at now. The Madison City Clerk’s Office will offer extended hours for absentee voting: 8 a.m. – 7 p.m., Tuesday, May 29, through Friday, June 1. The Clerk’s Office in the City-County Building on Dr. Martin Luther King Boulevard, just a block off the Square. Fitchburg residents who wish to register or vote absentee may do so at the Fitchburg City Clerk’s Office, 5520 Lacy Road, 7:30 am-4:30 pm Monday through Friday through June 1. On Tuesday, June 5, there will be recall elections for Governor and Lt. Governor all over the state. Governor Walker will face challenger Milwaukee Mayor Tom Barrett. Lt. Governor Rebecca Kleefisch will face Madison Firefighter Mahlon Mitchell. To see the candidates on your ballot, visit vpa.wi.gov <http://vpa.wi.gov> . In-person absentee voting began on Monday, May 21, and will conclude on Friday, June 1, at 5 pm or the close of business, whichever is later in your municipality. New absentee voting laws became effective on April 20. It is now a felony to vote at the polls if you have returned your absentee ballot to the Clerk’s Office. Previously, you could change your mind about who you were voting for and could cast a vote at the polls as long as you arrived at the polling place before they processed your absentee ballot. Now absentee voters may only change their vote if they request a new ballot from the Clerk by the deadline for requesting an absentee ballot (5 p.m. the Thursday before the election for most voters, 5 p.m. the Friday before the election for indefinitely confined and military voters, and the close of business the Friday before the election for in-person absentee voters). For more information about the Recall Elections, please visit the Government Accountability Board <http://gab.wi.gov/node/2337> website. The League of Women Voters will not be producing a voter guide for the recall elections. However, Wisconsin Public Television and Radio has a good site <http://wisconsinvote.org/> with nonpartisan information about candidates. from League of Women Voters of Dane Co., Inc.
To register to vote and to vote, eligible voters must be United States citizens, age 18 or older by Election Day, and residents in a municipality (city, town, or village), or ward within a municipality, for 28 days before an election. Any persons convicted of felony are not allowed to register or to vote unless their civil rights have been restored by completing their terms of sentence, including probation or parole. Your municipality for voting purposes is where you actually live, not necessarily the same reference as your post office or phone. To check individual voter registration status and polling place, as well as sample ballots, visit the Governmental Accountability Board’s Voter Public Access <http://vpa.wi.gov> site. Voters who live in the Fitchburg part of the neighborhood cast their ballots at Fitchburg Fire Station #2, 5415 King James Way, on the other side of Verona Road and just north of McKee Road (Co. Rd. PD). This location is about a mile from our neighborhood. Scott Walker and whether Mahlon Mitchell will take over from Lt. Governor Roberta Kleefisch. If needed, you can get a free ride to the polls by calling Union Cab. Turns out that political ads on TV - constant, overwhelming, and expensive as they may be - are not the best way to influence voters. A recent chart I saw shows that one-on-one conversations are by far the most effective, followed by door-to-door canvassing. Phone calls, postcard-writing, and e-mail “blasts” vie for much less effective third place. TV ads take a distant 6th place. The chart did not distinguish between robo-calls and real person calls. This summer, Agrace HospiceCare will host a free seven-week grief support group for elementary through high-school aged children and their parents/guardians who are grieving the death of a loved one. The Family Series Support Group will take place each Wednesday, June 13 through August 1, from 5:30 p.m. – 7:00 p.m. at Gilda’s Club, 7907 UW Health Court in Middleton. The group will not meet July 4, in observance of the Independence Day holiday. Participants are divided into groups by age, and children complete an activity that fosters a discussion among their peer group. In addition to receiving grief support, the adults’ group discusses concepts specific to parenting after a death. Light refreshments are served at each session. Pre-registration is required for this free series. To register, call Jessie Shiveler at (608) 327-7135. Agrace recommends waiting two to three months after a death before joining a grief support group. April 19th marked my first year as your new Dane County Executive – a year when I formed new partnerships to address the great challenges our county faced. My first budget came with historic challenges. But I worked with our workers to find nearly $2 million in savings for this year and the next. And when the state budget left Dane County with a historic budget deficit, I got to work achieving new community partnerships that prevented devastating cuts to human services and actually increased dollars to programs that protect our most vulnerable. As Dane County was feeling the effects of the national economic downturn, I brought together hundreds of economic development leaders, government officials, businesses, and workers, to get their advice and ideas. Afterwards, I created the county’s first Office of Jobs and Prosperity to aid in our recovery. Pollution in our lakes is a problem as well, and we know what must be done. I have brought together the public and private sector, farmers and the business community, to form unprecedented partnerships that will clean up our lakes at a critical time. As our gas prices continue to climb, costing taxpayer dollars – I expanded the effort to convert landfill gas into cleaner, cheaper home grown fuel for the county fleet. And when we needed to determine the future of two critical county facilities – The Alliant Energy Center and the landfill – I formed a task force that is charting a course to keep important partners like World Dairy Expo in Dane County, and developed a comprehensive solid waste strategy that will extend the life of our landfill for decades. This year proved if there was a challenge, we could overcome it. If there was a problem, we could solve it by working together the Dane County way. I look forward to working with you in the year ahead as your County Executive. The Wisconsin Dental Association (WDA) Foundation/WDA Mission of Mercy will be hosting the largest dental mission ever staged in the United States on June 29 - 30 at the Exhibition Hall at Alliant Energy Center. The Hall will be transformed into a large-scale dental clinic treating adults and children with limited financial resources or who are otherwise unable to visit a dental office. This two-day event includes over 1,800 volunteer dentists, hygienists, assistants, students, and community workers from throughout Wisconsin. Doors open at 5:30 am. Approximately 1,700 patients will be treated each day on a first- come, first-served basis until about 5:00 pm. WDA Mission of Mercy needs both dental/medical personnel and non-professionals to volunteer for this event. Volunteers may work in one the areas listed after their job titles* or may choose to assist in any of the non-dental positions. All dentists and hygienists delivering patient care must hold a current Wisconsin license. Every dental/medical volunteer listed below must have current heptavax shots if working any of the dental/medical positions. All work is done under local anesthetic; no nitrous or sedation will be available. All volunteers must be at least eighteen years old. More than 1,800 volunteers are needed. 1. Recall Election, Tues., June 6, 7:00 am-8 pm. 2. Next DMNA Council Meeting, Wed., June 6, 7 p.m., Prairie UU Society. Council will talk about recent shooting incident on Britta Parkway. Whitney Way, and proposed noise wall locations being considered. interchange and the Seminole Highway and Beltline interchange. 5. Proposed pedestrian and bicycle considerations/accommodations. 6. Preliminary aesthetic considerations for the project. 1. County M and County PB - signal and turn lane extensions proposed. 2. County M and County D (Fish Hatchery Road) - signal and turn lanes proposed. 3. County D and Whalen Road - turn lane and bike accommodations proposed. 4. Seminole Highway and Lacy Road - turn lane additions. 5. County PD and Seminole Highway - eastbound left turn lane extension. 6. Seminole Highway and Sentinel Pass - signal and turn lane extensions. 7. Whitney Way and Gilbert - southbound left-turn lane extension. 8. Seminole Highway, Yuma and Nakoma Drive - signal and revised pavement marking. process will be discussed for residents that are directly benefitted by the noise walls. acquisition for the project and about the acquisition process. This notice comes to you complements of the Dunn’s Marsh Neighborhood Association. Posted by Mary Mullen, Dunn’s Marsh Neighborhood Association Communications, 298-0843. Worried about the 15% reassessment? Are you a home owner concerned about your recent property reassessment? You're not alone! The entire neighborhood was hit with a 15% DROP in property values. We are not looking for a time commitment from you - at the very least we're trying to get a handle on who is going to get their property reassessed by the City this summer (instructions are on the little card you got in the mail). The deadline for initiating that process is MONDAY, MAY 14. This request is passed on to you by the Dunn’s Marsh Neighborhood Association. It is being sent only to people living in the Crawford and Marlborough sections of the neighborhood since this is the area that has been revalued at 15% below last year’s rate. Also noted are assessments that are not based on the 15% general devaluation along with the reason for the different rate of change. Often a lesser revaluation or even a value above the 2011 assessment is due to “new construction before trend” or “individual review for equity.” In other words, your action as an owner can have an effect. 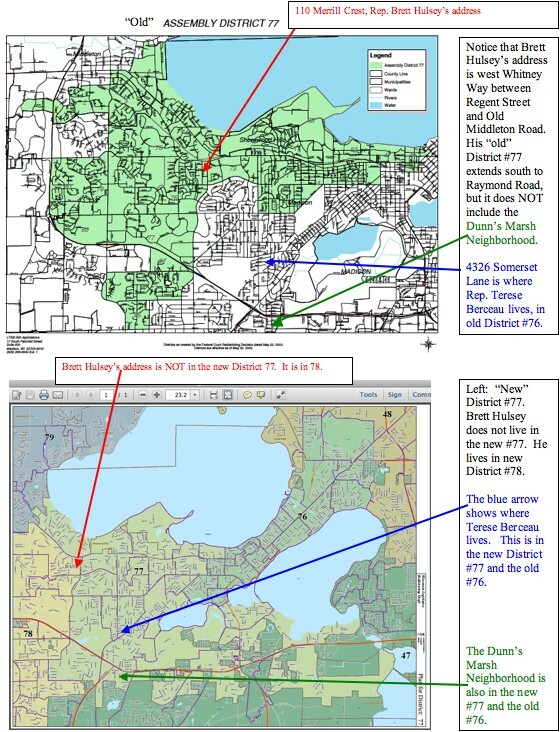 The procedure for filing an objection and appealing the assessment can be found at http://www.cityofmadison.com/assessor/assessmentAppeals.cfm. This is a SPECIAL ELECTION ISSUE, plus a lot of other news that has accumulated in the last few days. VOTE! VOTE! VOTE! on Tuesday, May 8. You may register at the polls with your Wisconsin driver’s license or Wisconsin ID number, Social Security number if you don’t have a Wisconsin license, and proof of residence. You DO NOT have to show ID to vote. 6 - Students Can Vote This Summer. Details Here. 7 - Who Is Our State Representative in the Assembly? It’s a Puzzle. 10 - Know Someone New to the Neighborhood? 15 - Bus 75 Can Take You to Verona and the Epic Campus. We are still looking for City of Madison residents to work at the polls on Tuesday, May 8, and of course on June 5. If you would like to work at the polls and are not already scheduled to do so, please send an e-mail message to voting@cityofmadison.com to let us know whether you would like to work Downtown, East, North, South, or West Madison, and to let us know whether you would like to work 6 a.m. to 1:30 p.m., 1 p.m. to close, or 6 a.m. to close. This job pays over $11.00 and hour. A full day shift pays over $200. When I attended poll worker training the other day, I learned that voters may be confused by the ballot. Here’s some information to help you cast a ballot that will count. First, let’s consider the primary for Governor. There are 5 candidates for governor in the Democratic primary and 2 candidates in the Republican primary. The trick is to remember that you can only vote for one candidate for Governor. So choose whether you want to vote for a Republican or a Democratic candidate. 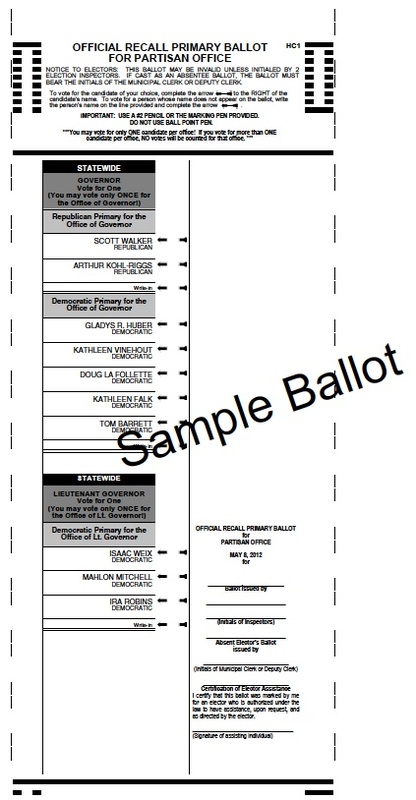 If you mark your ballot for a Republican candidate for Governor and then also mark it for a Democratic candidate for Governor, neither vote will be counted. The tabulator will spit your ballot out without counting it. Fortunately, you can get a second ballot if you mess up the first one at the polls. However, if you voted absentee and marked 2 Governor candidates, your vote will not count for either. To review: Vote for only one candidate for Governor. Surprisingly, even though you may choose to vote for a Republican candidate for Governor, you can vote in the Democratic primary for a candidate for Lt. Governor. The Lt. Governor race is a separate primary. There are 3 candidates for Lt. Governor in the Democratic primary. There is no Republican primary because no one is challenging Lt. Governor Kleefisch. One of the Democratic candidates will be facing Kleefisch during the June 5 recall election. Read article 2b for information on these candidates. Some are so-called “protest candidates” who are Republicans running as Democrats, so that may influence your choice. 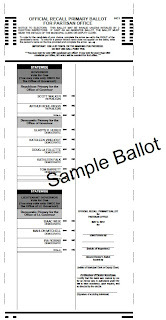 Check out the sample ballot and the instructions on the ballot so that you will be prepared, and your vote will count. The Democratic gubernatorial candidates are GLADYS R. HUBER (Democratic), KATHLEEN VINEHOUT (Democratic), DOUG LA FOLLETTE (Democratic), KATHLEEN FALK (Democratic), and TOM BARRETT (Democratic). The Republicans running for Governor are SCOTT WALKER (Republican), and ARTHUR KOHL-RIGGS (Republican). ISAAC WEIX (Democratic), MAHLON MITCHELL (Democratic), and IRA ROBINS (Democratic). The purpose of the primary is to choose one candidate from each political party when 2 or more are running. Before you vote in the Lt. Governor primary on May 8, you may want to know that one of the candidates may not be what he seems. Whether you favor the Democratic or the Republican side, this information is for you and may influence your decision on which arrow to fill in. The candidates are Mahlon Mitchell, a Madison firefighter who participated quite visibly in the protests that broke out after Governor Walker’s published his budget repair bill in 2011; Ira Robinson, also an actual Democrat who is a Milwaukee private detective; and Isaac Weix, a Republican from Menomonie who is running as a Democrat. You can hear and read a Wisconsin Public Radio report on all three at http://news.wpr.org/post/three-wisconsin-democrats-hope-unseat-lt-gov-kleefisch. All three voices are featured on this report. To find out more about the individual candidates, check out their presence on the Internet. Mahlon Mitchell’s website is http://mahlonmitchell.com/ The most lengthy and useful information I found was an interview by WisconsinEye. Find it at http://wiseye.org/videoplayer/vp.html?sid=7949 , also available at http://wiseye.org/Programming/VideoArchive/EventDetail.aspx?evhdid=6022 if the first link does not work. Ira Robinson’s website is http://voteira.com/. I could find no other detailed information about him. Although I couldn’t find a website for Isaac Weix, he has a Facebook presence at www.facebook.com/pages/Isaac-Weix/113811603756 <http://www.facebook.com/pages/Isaac-Weix/113811603756> . More can be learned about his politics at http://www.ballotpedia.org/wiki/index.php/Isaac_Weix. The May 8 election is a primary election to narrow the field of candidates running in the recall election for Governor and Lt. Governor. The recall election will be held on Tuesday, June 5. Absentee voter procedures have changed. It’s wise to know that if you already cast your absentee ballot. In the past, an absentee voter could come into the polls on election day and choose to vote at the polls instead. A voter might want to do that if s/he had had a change of mind about the choices or simply wanted to vote in person at the polls. The absentee ballot would not be counted then. But things have changed. Now, if you voted at the clerk’s office in advance of the election or you have sent your absentee ballot in, it is a felony to vote at the polls. This is true even if your absentee ballot has not been received by the clerk prior to the election. Absentee ballots are counted as long as they get to the clerk’s office by the Friday after the election as long as they were postmarked on or before election day. It is OK to vote at the polls if you did not send your absentee ballot in. If an absentee voter comes to the polls, the poll workers should be knowledgeable about this change. The poll book will indicate that you requested an absentee ballot. The poll book will also indicate whether the ballot was returned (received by the time the poll book was printed) or simply whether it was issued. If the absentee ballot was sent to you but was not received by the time the poll book was printed, the poll worker should ask if you actually sent your absentee ballot back. If you sent it back, it is a felony to vote at the polls. If you did not send it back, you may vote at the polls. As you may already know, there will be only one week of Open Registration between the May election and the June election. Registration opens on Wednesday, May 9, and will close at 5 p.m. on Wednesday, May 16. If you are looking for a non-partisan voter outreach opportunity, we have hundreds available at www.cityofmadison.com/VoterOutreach <http://www.cityofmadison.com/VoterOutreach <http://www.cityofmadison.com/VoterOutreach> > . We plan to add several campus locations to this site by Tuesday, May 8. When registration is closed, you can help people complete their form up to the point where they would sign the form. They will need to bring that form and proof of address (utility bill, bank statement, paycheck, driver license, government document, or residential lease) into the Clerk’s Office by the Friday before the election, or to the polls on Election Day. Because the voter registration form can be rather intimidating, knowing that your form is complete before you go the polling place can at times be what it takes for someone to feel empowered to vote. Monday, May 7, 3 – 4 p.m.
Wednesday, May 9, noon – 1 p.m.
Thursday, May 10, 4:30 – 5:30 p.m.
Friday, May 11, noon – 1 p.m.
Friday, May 11, 3 – 4 p.m.
Monday, May 14, noon – 1 p.m.
Tuesday, May 15, 6 – 7 p.m. Thank you for everything you are doing to facilitate the right to vote! The League of Women Voters of Dane County (LWVDC) is running an ad campaign on Madison Metro buses in conjunction with the city clerk's office. We would love to have voter registration workers at the transfer points, but Metro has rejected that plan. Their concerns are safety and precedent related. SO, we would like to run voter registration stations on the sidewalks near each of the transfer points, and at heavily used bus stops. Are there any groups out there who would like to adopt a sidewalk near a transfer point? Weekdays 3-6 should reach the majority of homeward bound commuters. To volunteer for a shift or to sponsor a site contact me. If you know of other groups that may be interested, please forward this e-mail and copy me. Registrars who are double qualified in Madison and Middleton are especially wanted for University Avenue at University Bay Drive and University Avenue on the UW campus areas. In addition to the voter registration and outreach opportunities listed at www.cityofmadison.com/VoterOutreach (most slots are still available), please see the message below from the non-partisan Madison Student Vote Coalition. Hello Everyone. We are the Madison Student Vote Coalition, a non-partisan coalition of organizations and individuals dedicated to registering and motivating students to vote. While we have made great strides in voter registration this year, there is still much more to be done as students conclude their spring semester. At this important juncture before the recall elections, could you offer a short amount of time to help us with our upcoming voter registration drive during May 9-16? We are looking for Special Registration Deputies to help table at locations across campus to register students to vote. Please see the attached schedule of days/times/locations and e-mail madisonstudentsvote@gmail.com with your availability to volunteer. In addition, please include your phone number so that we can contact you to confirm your shifts and let us know if you have NOT tabled with us before. Any amount of time you can volunteer is greatly appreciated. Ideally, we would like to have 2-3 people signed up for each shift. 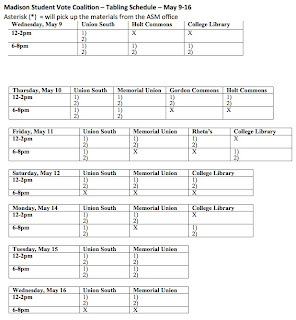 Also, if you are signing up for a time slot that begins a block of shifts at any location, please indicate if you are able to stop by the ASM office beforehand to pick up a packet of voter registration materials. Thank you in advance. We look forward to hearing from you! STUDENTS WHO CONSIDER FAMILY/PARENTS’ HOME THEIR VOTING RESIDENCE: If you prefer to vote in your family or parents’ home district, (and your family has lived at that address for more than 28 days before Election Day), you can register and vote in the Recall Election at the voting location for your family home. Election Day registration is still available. 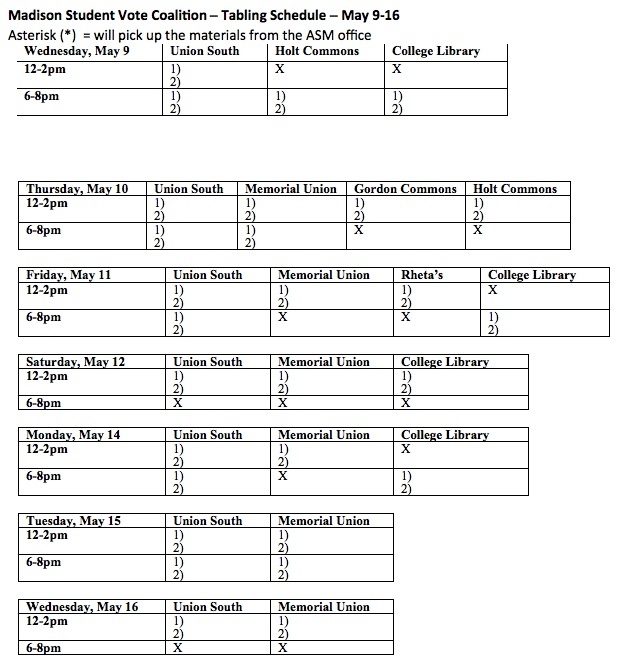 STUDENTS WHO CONSIDER COLLEGE THEIR VOTING RESIDENCE: If you are moving after May 8 and before June 5, you can register and vote at your polling place based on where you are living before May 8. If you’re just moving within the same city, you can even go on June 5 and vote in person at the polling place that corresponds with the address or dorm you lived in before May 8. STUDENTS CAN GET AN ABSENTEE BALLOT IN THE MAIL. Students who are moving after May 8 and before June 5 can register to vote where they live before May 8, fill out an absentee ballot request form, and ask the clerk to mail you the absentee ballot at the address you’ll be at in late May/ early June. For your ballot safety, contact your clerk directly for a ballot request and mail your absentee ballot back so that the clerk RECEIVES it by June 5. TO REGISTER TO VOTE, HAVE PROOF OF YOUR ADDRESS. To register, bring a document with your name and voting address: a university photo ID along with a university fee receipt or list of dorm residents; driver’s license; state ID; recent utility bill (electric, cell, phone, cable, etc. ); lease; bank statement; pay check; employer ID card; or government document or check. YOU DO NOT NEED PHOTO ID TO VOTE IN WISCONSIN for the Recall Election. But, if you have a Wisconsin driver’s license or state ID, bring it, so you can write your ID number on the voter registration card. (If you don’t have a license or ID, you’ll just write the last four digits of your social security number on the registration card). Questions or problems? The ACLU of Wisconsin and other groups will be part of Election Protection on June 5. Call us on Election Day at 1-866-OUR-VOTE. Like the Wisconsin Election Protection Facebook page <http://www.facebook.com/pages/Wisconsin-Election-Protection/122060611221751> or follow @EPWisco on Twitter <#%21/EPWisco> to share your stories, questions and concerns! For months, we’ve been trying to get the proper elected representatives listed in the web site the City of Madison provides for our neighborhood. But for months, we did not make any headway. Finally, Kyle Richmond is listed as our County Board rep instead of Brett Hulsey. But why is Brett Hulsey still listed as our state Representative in the Assembly, and why is Terese Berceau not listed? The state’s explanation, given on the state legislature website, is that both Brett and Terese are our representatives for now. How can that be? It’s because of redistricting due to the 2010 census and legal opinions given to the legislators who were also wondering what area they represented and how they could spend money. The Wisconsin Government Accountability Board has indicated <http://legis.wisconsin.gov/W3asp/images/GABmemo.pdf> that the legislative districts established in 2002 remain in effect for election purposes and that the legislative districts established in 2011 Wisconsin Act 43 are also in effect for purposes of providing services to constituents. The Joint Committee on Legislative Organization has adopted a policy authorizing the provision of constituent services to individuals residing in either set of legislative districts. Each of the legislators listed below is authorized to provide constituent services for the address provided. 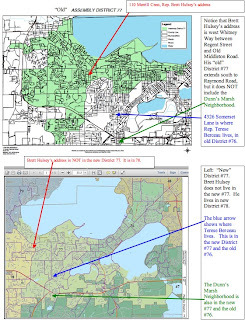 The site then shows that for the Madison part of the Dunn’s Marsh Neighborhood, Senator Fred Risser and Rep. Terese Berceau represent us based on district boundaries established in 2002. Based on numbers of the districts defined in 2011, Senator Risser and Representative Brett Hulsey also represent us. HOWEVER, when I checked Representative Hulsey’s address, I found that he does not live in the district shown on the map that includes our neighborhood either according to 2002 lines or 2011 lines. So - how can the state website say he represents our neighborhood? He lives in and serves old District 77 which does not include our neighborhood. His address is in new District 78 which also does not include our neighborhood. On the other hand Terese Berceau now lives in and serves old District 76 which includes our neighborhood. New District 77 includes our neighborhood. Her home is located in both the old and new districts although the number of the district has changed as have the boundaries. Therefore, it definitely seems that she is our representative. Conclusion: Apparently, it’s only the numbers that count for right now. Since Brett’s old district was called 77, the state website says he serves the new 77 even though he does not live in the new 77. My conclusion? The City web site for the Dunn’s Marsh Neighborhood should definitely include Terese Berceau as our state representative in the Assembly. Wish me luck in getting the City to list her as our rep.
By the way, if you read the excerpts from Berceau’s April newsletter - Article 18.2 - you’ll see that she is also concerned about this issue, and she knows she is our representative in the Assembly. Four city assessors came to the May meeting of the Dunn’s Marsh Neighborhood Council, three from Madison and one from Fitchburg. About 15 residents and all 7 Neighborhood Council members were present to hear the presentation and ask questions. A lot of questions were asked. The assessors had been invited by the Council because quite a few homeowners are upset with the fact that Madison assessments for the neighborhood are down 15%. That’s the strongest decline in all of Madison. Overall, in Madison assessments for residential properties have gone down just 2.7%. Assessments of all kinds in Madison are down 1.6%. Although the Fitchburg assessments aren’t out yet, Fitchburg Assessor Mike Procknow estimated that homes in the Fitchburg part of the neighborhood will decline about 7 to 9%. Neighborhood residents wanted to know why the assessments had gone down so much. Madison Assessor Mark Hanson explained that assessments are based on arms-length sales in the neighborhood. There were six such sales in 2011 and two early in 2012 that they used to establish the percentage. Those sales averaged to values 15% below the 2011 assessed values. Therefore the assessors lowered the value of homes that much. Does a lower assessment mean that neighborhood homeowners will pay 15% less in property taxes, one questioner asked. Hanson said that property taxes will go down for us, but probably not 15%. One reason is that in general, all tax assessments are off last year’s levels, so a higher mill rate will be required even if the city, county, school district, and vocational school needs stay the same. However, generally taxes go up due to costs going up; and this year with state aids being much lower, local governments may have to raise their taxes just to keep services going at the same level as this year. Hanson felt that Madison residential property owners in the neighborhood might experience at least a 5% reduction in property taxes. Several people wondered why sales prices had gone down so much. Some people thought the decline was due to buyers knowing about the ATC high voltage lines along the Beltline or because of the coming Verona Road/Beltline construction project. Another felt that buyers don’t generally know about planned projects, but the sellers might be wanting to get out of the neighborhood and therefore would settle for a lower price than normal. Scott Matthews, City of Madison Property Appraiser, suggested that the ATC line was not the big influence. Other properties along the Beltline corridor did not take such a precipitous dive. Madison Assistant Assessor Joanne Terasa who specializes in residential assessments, pointed out that last year it was the higher cost homes that lost a lot of value. This year, lower value homes sold for relatively less. However, she noted that this is the largest decrease across the City of Madison since the 1970s. These days, it takes 9.2 months to sell a home on average. Fitchburg alder Carol Poole suggested that homeowners should resist being too reactive to the lowered assessments. She noted that the economy, not local projects, is the biggest factor in home values. Property owners need to take the long view, rather than being frightened of a single big drop or several small ones. People then explored what the lower assessments mean other than slightly lower property taxes. When assessments are lower than the amount of money owed for a mortgage, you’ve gone “upside down,” Scott Matthews explained. Then if you sell your house for less than what you owe, you have to make up the difference. Not good! What can people do to raise the assessments? · The notice of assessment changes explains how an individual homeowner can contest the assessment. · The assessors also provided a very helpful resource from the Wisconsin Department of Revenue, a booklet called the “2012 Guide for Property Owners.” It is available for download at http://www.revenue.wi.gov/html/govpub.html#property This publication is about the 15th one in the list at that URL. · As a community we could work on substantial improvement to the neighborhood. Curb and gutter was one suggestion, particularly on the streets that become rivers during rain storms such as Sheffield, Danbury, and the lower block of Milford. · After the meeting other suggestions surfaced such as publicizing the positive aspects of the neighborhood to realtors. This could include our connections to long-distance bikeways, good bus connections, the enormous amount of open space within and adjacent to the neighborhood, an active neighborhood association, and more. You are invited by the City of Madison West Police to a free landlord training session on May 16th, 2012, at the West Police District Office, 1710 McKenna Boulevard. Obtain from the Apartment Association of South Central Wisconsin (AASCW), information regarding new local & state landlord-tenant laws, best practices & changes in rental documents, policing concerns in the Russett, Balsam, Allied, Teresa Terrace, Betty’s Ln, Meadowood, Park Edge, & Park Ridge neighborhoods. Please register by contacting Captain Vic Wahl, the West Police Districtt, at vwahl@cityofmadison.com or heather@aascw.org or call 608-826-6226. The DMNA Welcomers Committee has been meeting for several months to put together a binder of materials to welcome newcomers to the neighborhood. We now have about 10 copies of this very useful resource that we want to hand out to people who new in the neighborhood. The DMNA Welcomers Committee is the new committee welcomes newcomers to the neighborhood. But it is a lot more than that. Committee members are graciously treated to a meal prepared by our hostess Diane Schultz before we begin the monthly meeting. It’s a chance to get to know each other better while we enjoy a good meal. Meetings are scheduled for the rest of the year. They are May 16, June 27, July 25, August 22, September 19, October 17, November 28, and December 12. Contact Diane Schulz at schultzieje@yahoo.com if you are interested in joining the committee. Our neighborhood weatherman David Martin confirmed the downpour that struck the neighborhood on Thursday, May 3. There were 4 separate episodes of rain that day with a total of 1.12 inches for the day. One thunderstorm dumped half an inch in a 20-minute period. Dave’s specialty at the University was weather. He keeps detailed records of rainfall in the neighborhood. You can’t get much more accurate than that. A public information meeting will occur on Thursday, May 17 to discuss the Verona Road (US 18/151) project in Dane County. The meeting will be held from 5 to 8 p.m. at the Fitchburg Public Library, Room 212 A and B, 5530 Lacy Road, Fitchburg, WI 53711. The project is divided into two stages. Stage 1 will reconstruct the Beltline from Whitney Way to Seminole Highway, and reconstruct Verona Road (US 18/151) from Raymond Road to Nakoma Road. Stage 2 will reconstruct Verona Road (US 18/151) from County PD to Raymond Road. The project involves reconstruction of the Beltline from Whitney Way to Seminole Highway, and reconstruction of Verona Road (US 18/151) from Raymond Road to Nakoma Road. 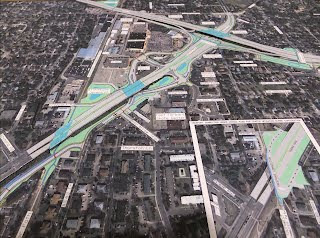 Proposed improvements include reconstructing the Beltline/Verona Road interchange; constructing a new jug-handle intersection at Summit Road and Verona Road; pedestrian and bicycle accommodations; installation of noise walls; and expansion to three lanes beyond Whitney Way on the Beltline. Seminole Highway, Yuma and Nakoma Drive - signal and revised pavement marking. Construction of the Beltline/Verona Road interchange is scheduled for 2014. The public is encouraged to attend the meeting, provide input and ask questions regarding this project. A formal 20 minute presentation will begin at 5:30 p.m. WisDOT Real Estate staff will be available to answer questions regarding land interests necessary for reconstruction and the acquisition process. Visit www.veronaroadproject.wi.gov <http://www.veronaroadproject.wi.gov> <http://www.veronaroadproject.wi.gov> for more information regarding the Verona Road (US 18/151) project. Open house dates, times and locations can be viewed under "Public involvement." If you are unable to attend the open house, or would like more information, contact Mark Vesperman at (608) 246-7548. Written comments regarding the project can be mailed to Project Manager Mark Vesperman, WisDOT, 2101 Wright Street, Madison, WI, 53704. Citizens who are deaf or hard of hearing and who require an interpreter may request one by contacting Mark Vesperman at least three working days prior to the meeting. An open house about the Verona Road/Beltline project will continue at two different locations during the next two months to promote public understanding of the Verona Road/Beltline Interchange project and project outreach. Wednesday, May 16, 5 to 8 p.m.
Wednesday, June 20, 10 a.m. to 2 p.m.
A meeting will be held at Upper Iowa State University, 4601 Hammersley Road, Madison, Wisconsin, 53711 on Wednesday, June 6, 5 to 8 p.m. If you are unable to attend the open house, or would like more information, contact Mark Vesperman at (608) 246-7548. Written comments regarding the project can be mailed to Project Manager Mark Vesperman, WisDOT, 2101 Wright Street, Madison, WI, 53704. Citizens who are deaf or hard of hearing and require an interpreter may request one by contacting Mark Vesperman at least three working days prior to the meeting. There’s now a bus route that can take you out to Verona and then further on to the Epic Campus west of Verona. It’s Route 75, an express bus with limited stops and service during morning and afternoon/early evening time slots. The closest stop to the Dunn’s Marsh Neighborhood is on Fish Hatchery Road at Caddis Bend, near the Copps Grocery Store. With over 100 adult learners on the Literacy Network waiting lists, volunteer tutors are needed now more than ever! Right now the Literacy Network is recruiting Personal ESL (English as a Second Language) Tutors <http://www.litnetwork.org/uploads/media/ESLtutorflyer.pdf> and Summer Community Literacy Tutors <http://www.litnetwork.org/uploads/media/CLtutorflyer.pdf>. Folks can also visit www.litnetwork.org <http://www.litnetwork.org> for more info or email Ms. Shawn Steen at shawn@litnetwork.org <mailto:shawn@litnetwork.org>. Volunteer tutors do not need to have experience or any foreign language skills –just patience, kindness, reliability and 2-3 hours a week to help an adult in the community learn to read, write or speak English. Want to have a ton of water fun? Then consider participating in the “Remarkable Rubber Ducky River Race.” It’s an annual event held at Tenney Park that benefits the Goodman Pool Scholarship Fund. This year it is on Saturday May 19, starting at noon. You may purchase Rubber Ducks in advance online at www.mallardsbaseball.com <http://www.mallardsbaseball.com> or on the day of the event. There will be a limited number of Rubber Ducks available so it’s best for event-goers to get there as early as possible or to pre-purchase. Ducks cost $2 for one duck or $10 for 6 ducks.All age groups are welcome to participate. The first 500 participants will receive a Rubber Duck as a keepsake from the event. The grand prize for the winner of the race will be a party for 20 at the “Duck Pond” in the new Home Plate club Seats on Opening Day (May 30) including the opportunity to throw out the ceremonial first pitch, 20 great seats for the game. The grand prize winner will also have the opportunity to receive an additional $1,000 in cash if he/she purchases optional insurance for their duck(s) courtesy of West Bend. This event is sponsored by the Madison Mallards Baseball Club, Madison Parks, the Madison Parks Foundation, and West Bend. 18.1 - Order Blue Books, highway maps, and Arts & Craft Fair Guides! If you would like to receive any or all of these free publications, please e-mail me at rep.berceau@legis.wi.gov with your complete name and mailing address. As you know, Wisconsin re-draws political boundaries every 10 years based on census data. This makes logical sense; as population shifts, districts should represent those changes. Unfortunately, the redistricting that took place this session caused a problem because not only did the boundaries of the districts change, but in many cases, the district numbers did, as well. To reflect the new Senate and Assembly districts the legislature updated its "Who Are My Legislators?" Web page. If someone enters an address on the Web site, it brings up a page that says who his or her elected officials were previously and who they will be as defined by the new districts. However, the Web site links legislators to their old district numbers, even if the numbers no long coincide with the new districts. This is leading people to believe that, for example, Representative Hulsey, is their legislator because his old district number was 77, even though my new district will have that number, and I will actually be their representative. My new district number will be 77 and includes University Heights and parts of my old district. My office is happy to assist you in determining who represents you if you indeed find yourself confused. Please call or e-mail me at 608-266-3784 or Rep.Berceau@legis.wisconsin.gov. Dane County will soon be home to an Aging and Disabilities Resource Center (ADRC) that will enhance long term care for older adults, adults with disabilities, and their families, regardless of income. Through outreach, education, and support, the ADRC will offer individuals and their families the assistance they need to live health and independent lives. Dane County's ADRC will provide individuals and their families information and access to a broad range of community resources available for older adults and people with disabilities. Around forty-five new employees will be hired to staff the facility in the weeks ahead. Services will include outreach to help staff to identify people at risk and connect them to needed services; education that will enable individuals to make informed, cost-effective decisions about long term care; and support to promote health and independence, such as helping young people (up to age 17 1/2 years) with disabilities transition from their school systems to adult services. The services will be provided to individuals regardless of their health condition, long term needs, or income. Dane County anticipates opening its ADRC in October of this year, and depending on the outcome of negotiations, will likely be located on Madison's north side. The Area Agency on Aging of Dane County will be co-located with the ADRC, further streamlining services for older adults. The county pursued federal and state funding for the new ADRC and is applying to receive more than $4 million to fund its establishment. The authorization to apply was approved by the Dane County Board and the County Executive the last week of March. Learn more about a new Madison Parks Forestry program called Heritage trees. It’s a way for citizens to officially recognize special and significant city owned trees in the community. These can be street trees or trees in parks, or they may be a grove of trees on city-owned property. Designation will help to protect them. Each year up to 5 nominated trees will be selected. • May 5, 1938 - Dr. Dorothy H. Andersen presents results of her medical research identifying the disease cystic fibrosis at a meeting of the American Pediatric Assn. • May 10, 1900-(1979) Cecilia Payne-Gaposchkin- Brilliant astronomer, discovered that stars are primarily made up of hydrogen and helium, but could only be appointed as lecturer since Harvard barred female faculty appointments. .
• May 10. 1909 -(1978) Maybelle Carter – Pioneer country music guitarist, one of the original Carter Family. • May 12, 1900 – (1994) Mildred McAfee Horton --President of Wellesley College (1936) Directed the U.S. Navy’s WAVES (Women Accepted for Volunteer Emergency Services) (1943). • May 14, 1904-(1976) Katharine McBride –President of Bryn Mawr, defied the McCarthy witch hunts of the 1950s. • May 17, 1915 –(1996) Olga Madar – Steller athlete, champion of women’s rights including the ERA and president of Coalition of Labor Union Women from (1974-1976). • May 23, 1892 – (1979) Lavinia Engle –Field organizer for the National American Woman Suffrage Association, and led battle to pass the first compulsory unemployment insurance legislation. • May 23, 1947-(1995) June Kenyon –Poet Laureate of New Hampshire. • May 21, 1911-(1988) Virginia Haviland – Children’s international Fairy Tale author. • May 31, 1893 – (1966) Elizabeth Coatsworth - Children’s poet and award-winning author.